Being a hobbyist, more specifically a train hobbyist, has made me use more raw skills than any other hobby. 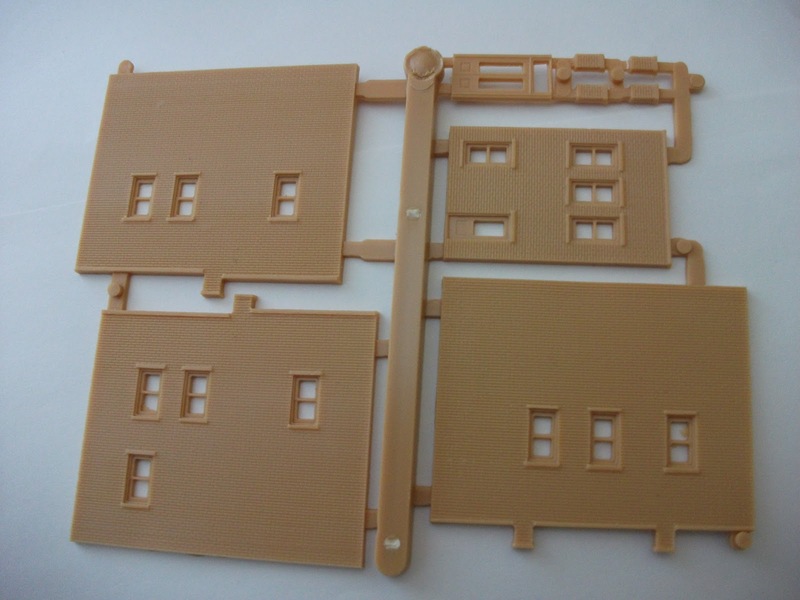 It involves all the skills of building plastic models–the prepping, the painting, the assembling, the disassembling, the repainting, It involves a fair bit of math– measuring angles, radii etc as well as re-measuring those same angles and radii. It involves a bit of electronics–soldering, wiring, re-soldering, rewiring. And it involves a bit of carpentry–constructing platforms to build the train on, backdrop holders, rebuilding those same things, quite possibly several times. I am no carpentry whiz–as I mentioned before, that is my brother’s department. Nonetheless, I try not to bother him with things I should be able to handle. I build my last train table myself and managed to do a fine job (though, I wish I hadn’t taken the advice to build the thing on a hollow door–plywood would have been better and it would have been much easier to wire.) Some friends even commented that I did a decent job (that is why you have friends by the way) I managed all of this without a serious collection of power tools. 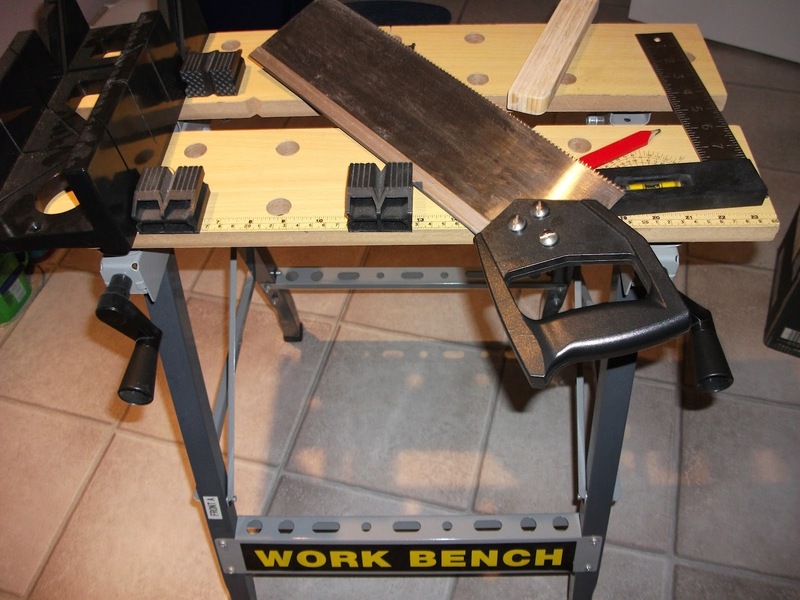 Hand saw, mitre box, and workbench can take you far. Besides giving myself a virtual pat on the back and feeling smug about my self reliance, it does bring me to today’s blog idea–making tools, or at least making do. The recommended rotating the model around a piece of sandpaper tacked to a piece of wood. Sounds good, but wouldn’t it be better to have the sandpaper glued to the wood? Whether it is better or not, I do not know. However, that is what I did. 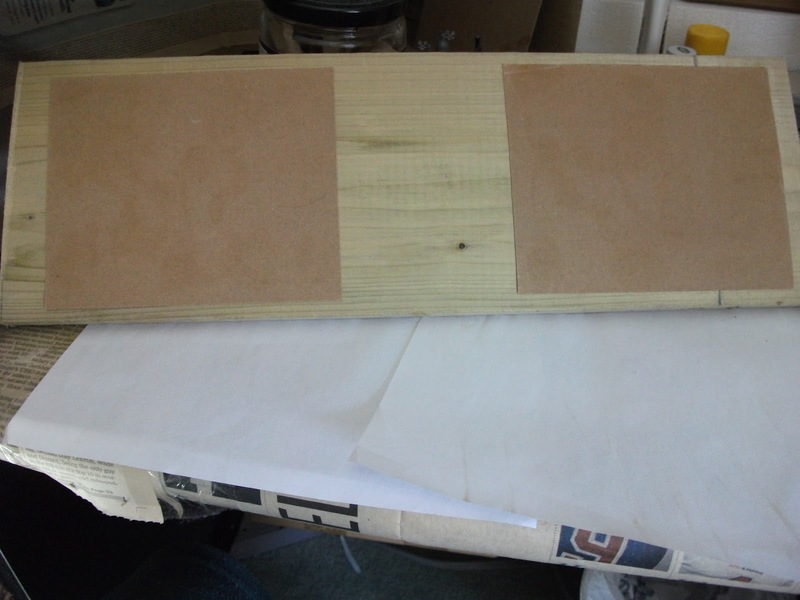 I got a piece of wood, cut it to size with my trusty handsaw, and glued two pieces of sandpaper to it. Now, I have what they asked for, built to my specifications. The negatives; it took me some time (finding the piece of wood, getting it down from its high storage area involved moving and setting up my not so light ladder, marking the cuts, cutting it, cleaning up, gluing and waiting for the glue to dry) and when the sandpaper is used up, I will have to make another one. The positives; I feel very manly. (in which case I feel entitled to a beer) I feel self reliant. All in all, I am confident that I can go to the next stage in the building process. If anyone would like to comment on the outdated tools they use, or the tools that they have made, that would be wonderful. Today was a day of hobbies. I went to the Japanese store to practice a little Nihongo and eat some Tonkatsu. 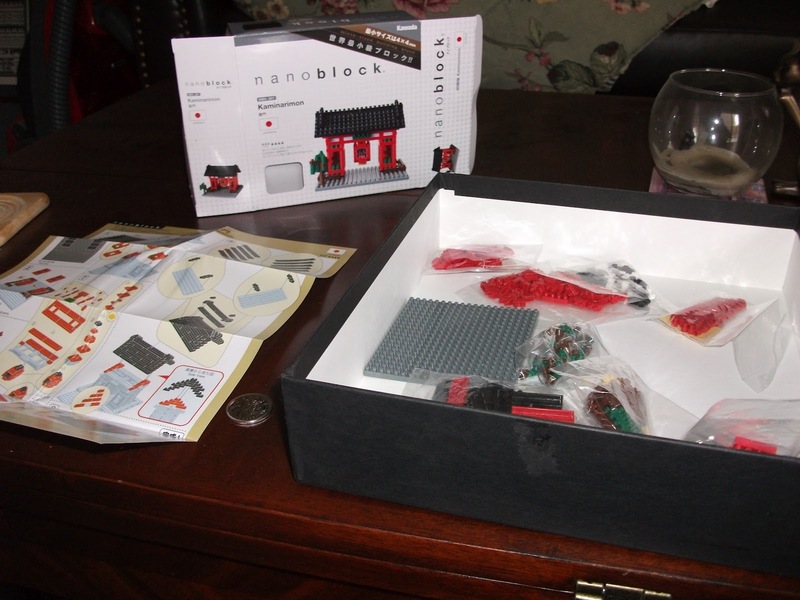 I followed that up with a financially draining visit to the train store, a complicated search for and tour of a plastic model shop, and a quick visit to the store that sells the Nanoblocks. Some would call it self indulgence, others would call it what I call it, a classic start to my vacation. Living life to the fullest includes doing your hobbies. Get ready to be shocked. There are two things that I am passively working on. I say passively because I really want to be able to do them, but am not sure I ever will. Probably if I put in a large amount of effort or work I could probably gain a respectable amount of skill, but somehow I am not sure that is going to happen. I want to learn how to juggle and I want to learn how to do yoyo tricks. I don’t think it is really about entertaining. I really can’t imagine performing in front of people. Don’t get me wrong, once I get over the stage fright, I can perform in front of people. It is a weird thing, but I can stand up in front of a crowd of strangers and make them laugh easier than I can ask questions to the clerk in a hobby shop. Rather than be an entertainer, I just want the skill to be able to do those things. 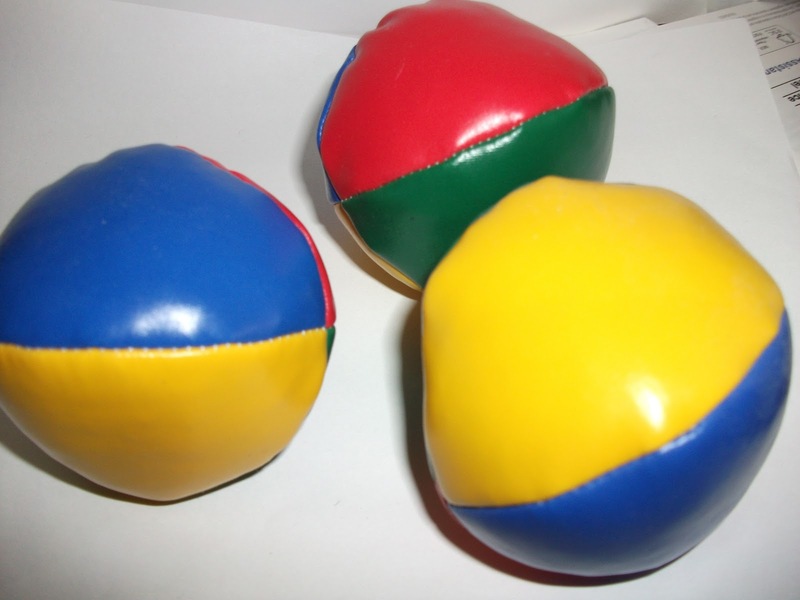 The juggling came from a Japanese TV show called TV Champion. It is a wonderful show that can make an interesting contest out of anything (juggling, making ramen, building Lego, making models, redecorating, and painting to name a few) They had a great juggling contest and I was hooked. Of course, my high school girlfriend was also a professional clown and could juggle–and ride a unicycle–so maybe that was part of it. The yoyo came from watching my brother do amazing things with the yoyo. and then watching very young people on YouTube do impossible things. 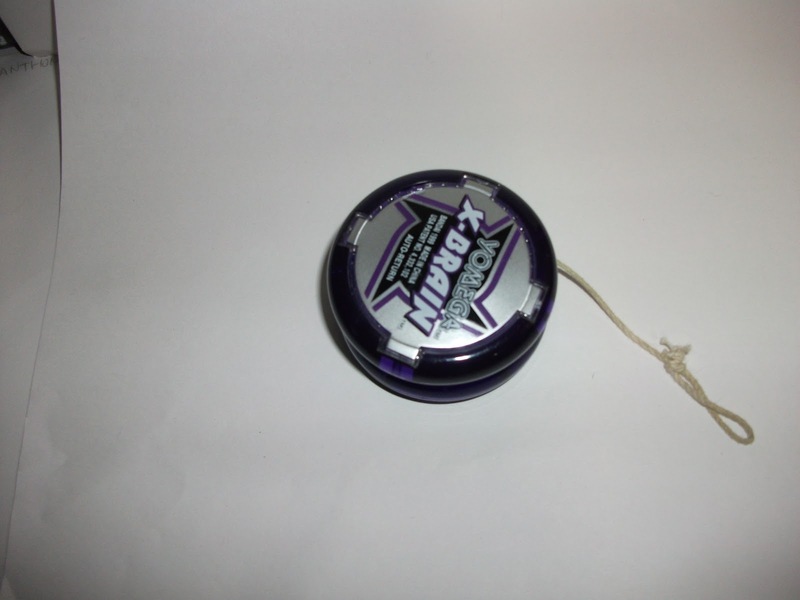 I bought the yoyo and can do some very basic tricks with it (okay, one trick. Thanks to the ball bearings, I can make it sleep for an incredibly long time) I got the juggling balls for Christmas and have never managed more than a few revolutions before they come crashing to the ground and I have to gather them up again. The instruction booklet recommended practicing over a table to make it easier to round up the balls. It would be good advice if they didn’t roll off the table. Not having mastered either of these skills I have considered giving these things away in my annual donate to family ritual, but have never managed to do it. Even now, hunting for the yoyo to take the picture, I was worried that I had given it away. Like most things, I think someday I will do it. I just wish I knew when that someday would come. As an ESL teacher I get an interesting world view. I have heard many interesting things, wild things and unbelievable things. One that affects the topic of this blog is what my students consider hobbies. Since my definition is broad I shouldn’t judge anyone’s definition, at least not harshly. Some students have told me that listening to music is their hobby. based on the fact that they listen to MP3 files, I tend to disagree. If listening to music is your hobby I think you would have some of the best equipment possible and the best recordings available. Granted, I am no expert, but since I have heard the hollow sounds leak out of the ears of several of my fellow commuters, I can’t believe that those are the best recordings. We can have computers with terabytes of memory, so we should be able to have some incredible digital recordings. Some of my students do indeed have top of the line headphones, but does that make it a hobby? Listening to music is certainly relaxing and enjoyable, but is it a hobby? I would have to say no, but might be persuaded to raise my acceptance level to undecided on a particularly good day. The other “hobby” (I have to use quotation marks because I can in no way agree that this is a hobby) that my students regularly admit to is,,,,,,, wait for this one,,,,, sleeping. I really don’t know what to say about this one. If I use my previous criteria, that would have to be one dynamite bed for this to be declared a hobby. The most recent student to argue this one was quite passionate, and quite articulate. She loved sleeping, spending as much as 14 hours one day (hopefully after finishing her homework). She said it felt good. If I sleep more than normal my body gets sore–or is that just because I am old? Lastly, several students said that shopping was their hobby. I can’t say as I have any passion for this, but I could see how they might see it as a hobby. They don’t buy something every time they go, they go into the same shops they’ve already been to, and they do a lot of research, spend a lot of time and money, and put a lot of energy into it. My inner self says to firmly put my foot down and say no, this is not a hobby. The truth is, I can’t. I can’t understand shopping as a hobby, but that doesn’t mean it isn’t. As for my readers, I would love your opinions on this. They are called Nanoblocks. Basically it is Lego, only smaller. 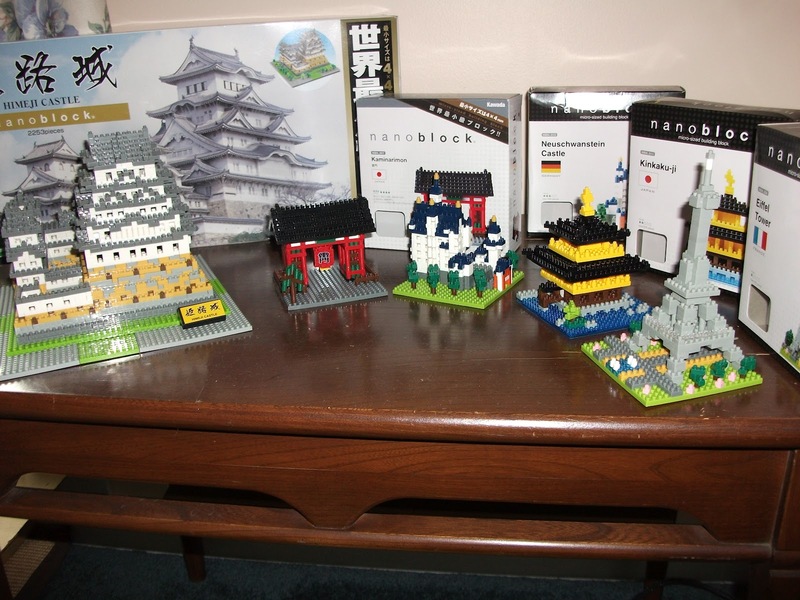 When you think about it, it is no surprise that these blocks come from Japan. 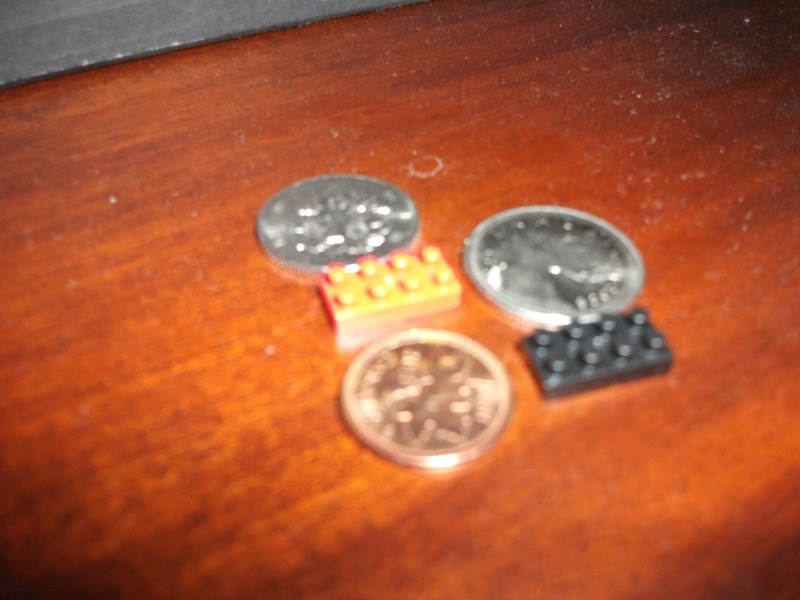 They made everything else smaller, so why not make something that is similar to Lego, only smaller. I saw these things first either on Amazon.jp or on BusanKevin’s YouTube page. Yes, surprise surprise I do check out Amazon Japanoften enough to spot what is new and happening in Japan. Some family members call it an obsession, even a sickness. Others think I was Japanese in a past life. Either one might be true, but that doesn’t really matter. I like hobbies, and truth be told, Japan is a country which really caters to the hobbyist. Back to Nanoblocks. The upside is that they are small, and even a large box doesn’t take up so much room when built. I have built five pieces so far and they don’t take up very much room. In fact, the marketing for the ones that I have done (famous landmarks) is that you can have the whole world on your desk. Looking at my photo you can see that is true. Of all of the ones I have built the castle was my favourite. It was a large, challenging, and came with a fantastic instruction book. 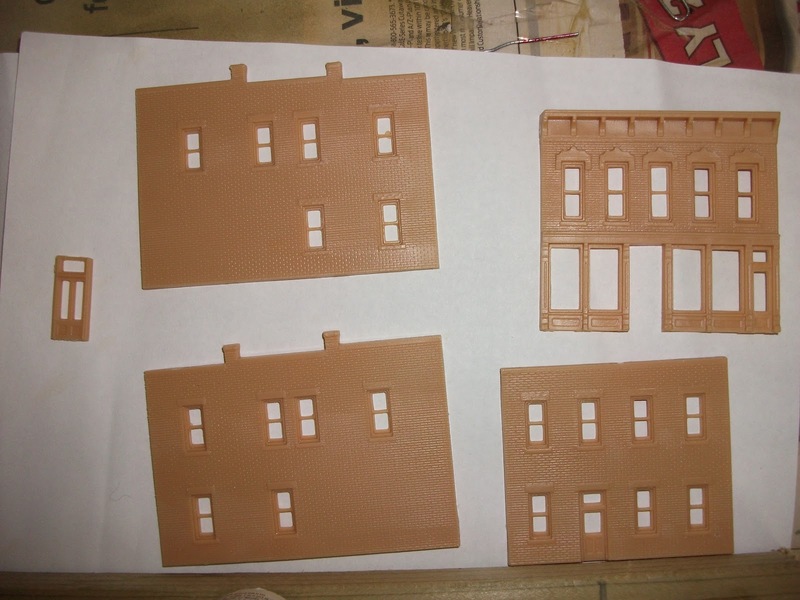 The instruction book set out how many of each type of piece was needed per step. This was good because the box had more than 2000 pieces. I enjoyed building it, but it took quite a bit of time. I think the end result was a good model though. Nanoblocks are readily available through amazon.com in the US (you lucky people) and here in Canada, Scholar’s Choice sells a few (a few, my advice is to call before you drive there–I had to get them taken from one store to a closer one before I could go and pick them up) As far as the price goes they are not horrendously expensive. 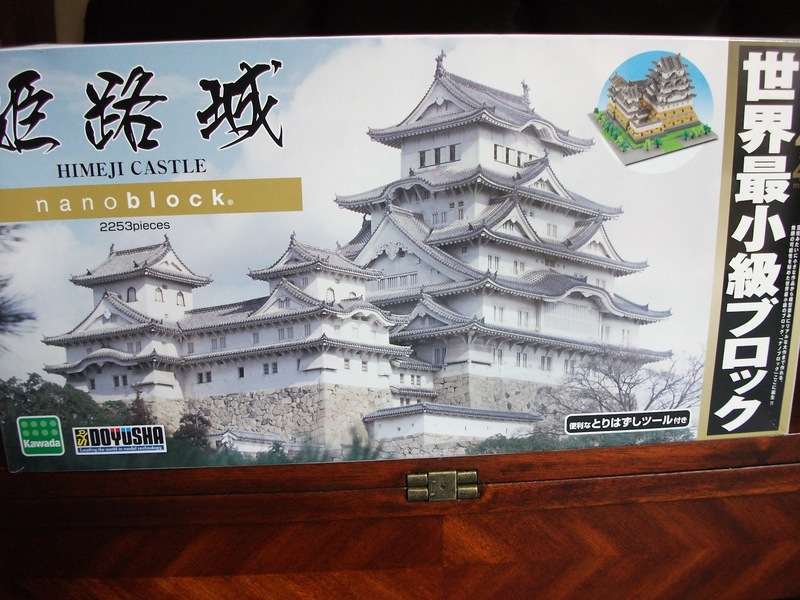 Granted, I did get the Castle (which is called HimejiCastle) sent from Japan–this is the deluxe one, a smaller one is available. Once assembled, there are a few pieces left over. I decided to organize mine in a Stanleyorganizer–perhaps it is not the best use of space. I have done five and I could probably put what is left over into a small box. 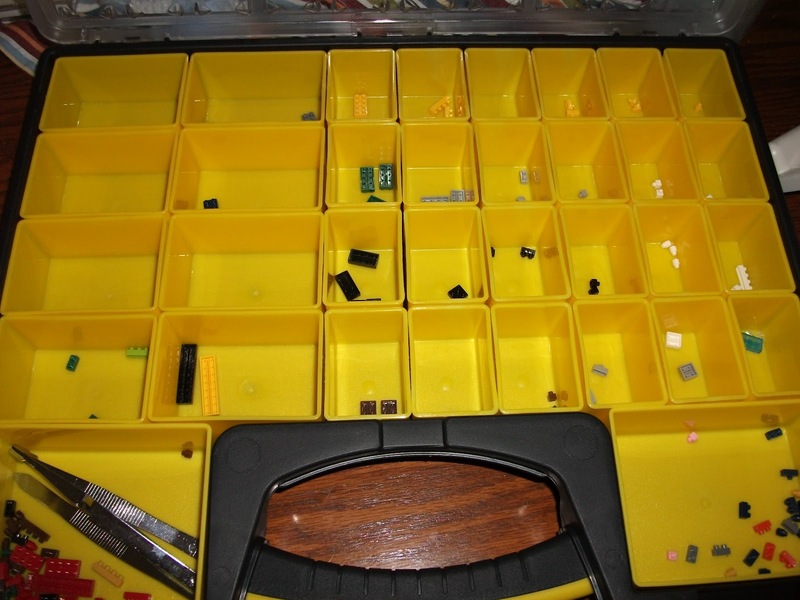 Why on earth did I choose such a big organizer….I am thinking long term. 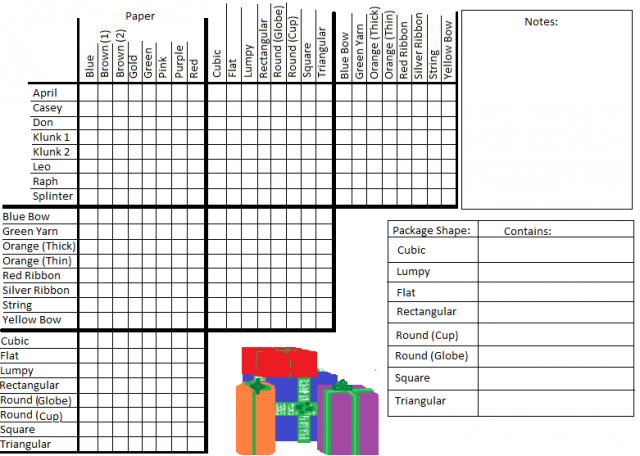 Someday I might have way too many of these tiles for even that huge organizer….someday. okay, so I haven’t reached storage capacity yet. 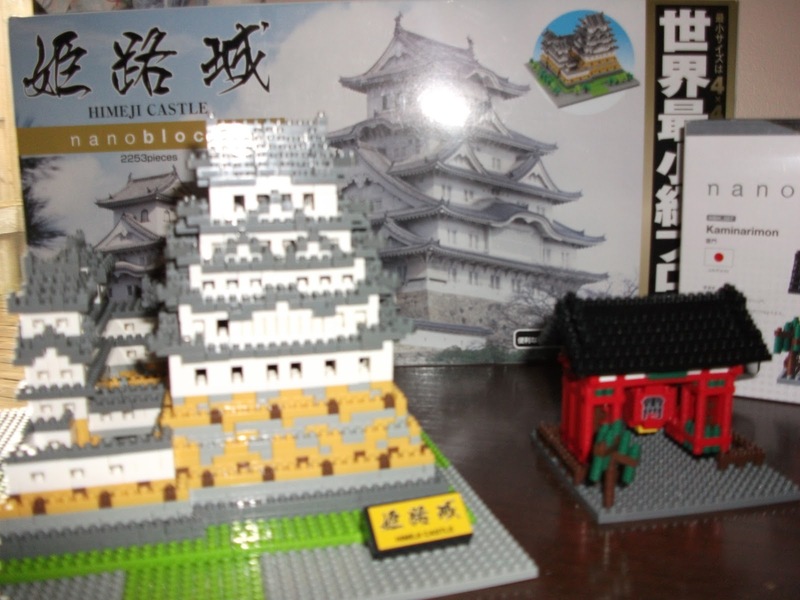 If you have some Japanese ability, you will be able to find some great examples of what artistic people can do on the Japanese homepage diablock.co.jp/nanoblock Typical of Japan, they hold yearly contests, and some of the work is unbelievable. As an addition to my family of hobbies, it seems to fit right in. It was creative, fun, challenging, and from Japan–see, perfect for me. I was riding the bus yesterday absentmindedly watching a woman flip through a book. She started out concentrating, but by the end she was just flipping through the book, not really looking at it. Because I was trying not to look, and because I wasn’t wearing my glasses–who’s kidding who? I was trying to look, but because my glasses were safely packed away in my bad I had to squint pretty badly, and I still couldn’t make out what she was looking at. I had a feeling, a sixth sense (without the dead people) that she was looking at a Japanese book. Maybe it was the layout of the book… I am not really sure. I squinted very hard, but I couldn’t make it out. When we neared our destination, she closed the book and I saw the cover had only two things written on it. It read N2. Aha (or as they say in Japanese Yappari!) 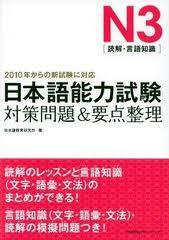 it was a Japanese textbook, specifically for the second level of the Japanese Language Proficiency Test (JLPT). Normally, or at least usually, I wouldn’t try to bother people but I felt I had to ask her. We only had a brief conversation about it, but I was feeling good about he coincidence. What struck me the most, and serves as a catalyst for this blog, is that she said it was her hobby. It is also my hobby, but I have neglected it for a while. So many other things seem really important right now. I am not sure any of them really are, but that is just the way things are stacked up right now. This brief encounter has reminded me that I need to spend a little time working on my Japanese, if only not to become rusty, and prepare for one of the levels of the exam.